The Indianapolis Colts have re-signed cornerback Pierre Desir to a 3-year deal worth $25 million, including $12 million guaranteed, per Ian Rapoport. Desir is only 28 years old and is coming off a career-high 77.7 overall grade last season. 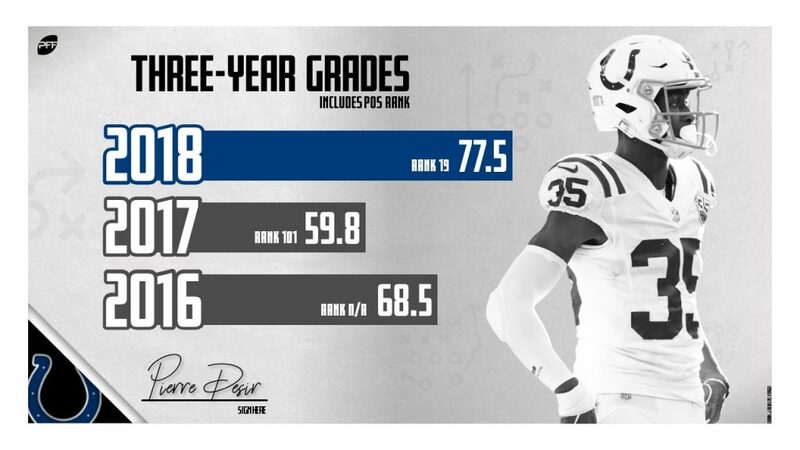 He played a crucial part in the Colts’ 12th-best team coverage grade (81.5) in 2018, something that the team would love to maintain in today’s pass-happy NFL. Desir was above average in coverage last season, earning a coverage grade of 73.1 – 28th out of 131 qualifying cornerbacks. On 534 coverage snaps, Desir allowed a passer rating of 88.1 (48th at the position) and allowed only 1.06 yards per cover snap (38th), but perhaps his most impressive stat was that he allowed a reception just once every 12.7 cover snaps, which ranked 21st out of 131 players at the position. As good as Desir is in coverage, it’s actually not the best part of his game. Desir is excellent in run support, as his run-defense grade of 90.6 ranked third among cornerbacks last season. Add in the fact that he logged 331 run-defense snaps –- the 30th most at the position –- and it makes it even more impressive that he was able to maintain an elite-level grade against the run. Whether he was blowing up wide receivers and cutting off the outside or making tackles near the line of scrimmage, Desir had a fantastic year against the ground game. As part of being a great run-defender, Desir also had the second-best tackling grade (88.2) among cornerbacks. On average, Desir missed a tackle just once every 38.5 tackle attempts, which was the fourth-best tackling efficiency at the position. On attempts strictly on running plays, Desir didn’t miss a single tackle. By re-signing Pierre Desir, the Colts bring back their best cornerback and their fourth-highest graded player from last season. In the Colts’ cover-2 defense, Desir’s ability as a run-defender fits perfectly and helps the Colts thrive in such a scheme. Considering that the Colts were blown out by the Chiefs in the divisional round, they’ll need to continue to improve their defense if they hope to advance further next year; having Desir back in the lineup is a great first step towards that goal.